We stopped at Annies for a long week-end recently and were very impressed. It was very easy to find, and parking was always available directly outside. Nicely situated for the local amenities, and perfect as a base for sight seeing in the North East. 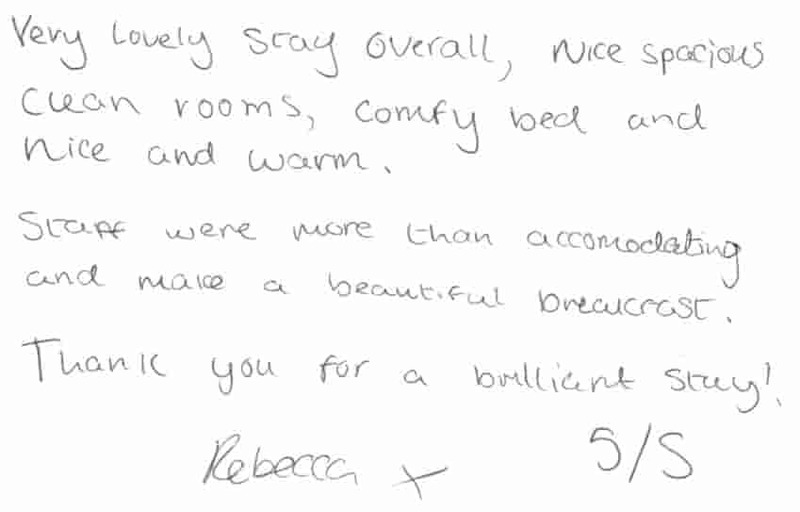 The welcome was very friendly and helpful, accommadation was lovely and clean, and very well kept. Breakfast was spot on. Excellent value for money. Hi. My good impression of this guest-house started when we met the young and lovely lady landlord. So chatty and friendly, I already realized I made the right choice of the accommodation. 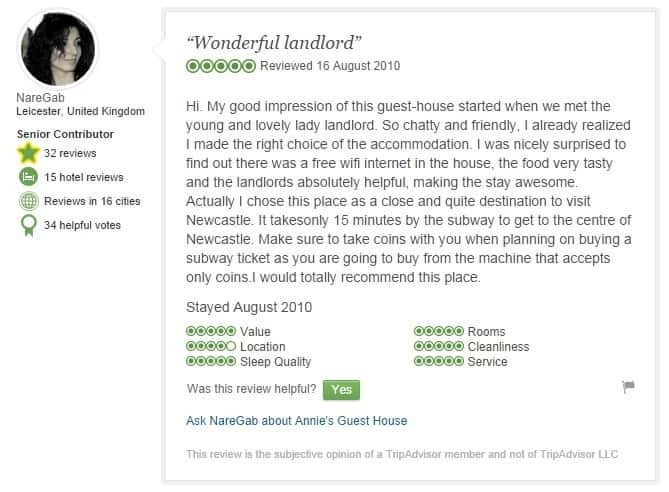 I was nicely surprised to find out there was a free wifi internet in the house, the food very tasty and the landlords absolutely helpful, making the stay awesome. Actually I chose this place as a close and quite destination to visit Newcastle. It takes only 15 minutes by the subway to get to the centre of Newcastle. Make sure to take coins with you when planning on buying a subway ticket as you are going to buy from the machine that accepts only coins. I would totally recommend this place. 5/5. Very Clean Bed and Breakfast. 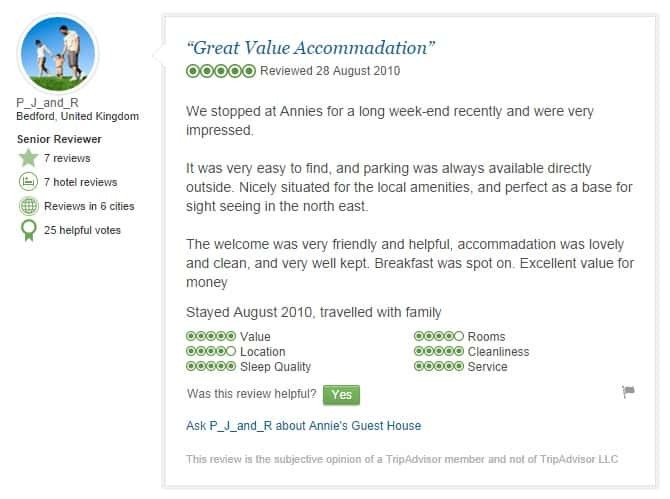 I stayed one night in Annies Guest House in a small single room. It was spotless, so very clean. It was also very modern furniture. It had a coffee and tea tray, hairdryer, free wi-fi access, good flat-screen digital Freeview TV, and use of fridge and microwave. It was so comfortable and pleasant to be in. The bed was very comfortable too. I was warmly greeted by the daughter of the proprieter who introduced me to everything and reassured me that I could contact her for anything, so I felt very looked after. The breakfast was fantastic, freshly done and the best fried breakfast I have had for a while. They were were very generous in their portions. This is a very good Guest House and well worth the price. I highly recommend it. 5/5. Excellent value cosy little place handy for the beach, town and Metro. Very friendly, excellent local knowledge. Excellent value little place handy for the beach, town and Metro. Very friendly, excellent local knowledge. Rooms aren't huge, but it's very clean, comfortable and cosy. A real antidote to slummy B&Bs or bland hotel chains. Very clean B&B. Excellent breakfast individually cooked to choice. Spacious bedroom. Good quality fixtures and fittings. Welcoming staff. I will be back next month !!!!! 5/5. An excellent accommodation 10/10. A very good standard accommodation in a quiet location for low price. My room was cleaned everyday during my eight night visit to North Eastern England. Tea/coffee restocked daily. Breakfasts were superb. Internet (wireless) and parking were both free. Has satellite television channels also. Train station around 5 minutes walk to the west for reaching Newcastle central. Definitely one to come back to and I would recommend to others also. Great Value Bed and Breakfast. Room had double and two full size single beds, lot of other places use put up beds, or sofa bed. Breakfast was exceptional value for money. Yes with this room we had to share toilet & bathroom on a diffrent level but for what it cost us it was worth it. They do also have ensuite rooms. Good Metro service close by. Very friendly and helpful. 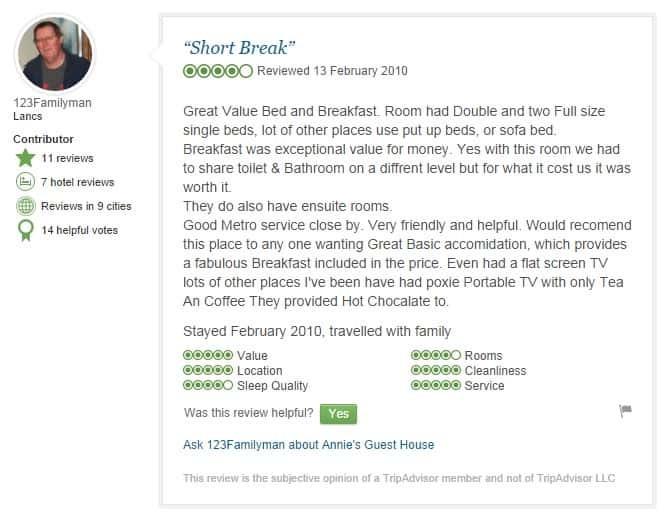 Would recomend this place to any one wanting great basic accommodation, which provides a fabulous breakfast included in the price. Even had a flat screen TV lots of other places I've been have had poxie Portable TV with only tea and coffee they provided hot chocalate too. The welcome was friendly and I was provided with a map of the area and an explanation of where things were. I had a single non-en-suite room, which was small, but comfortable. Breakfast was lovely and was cooked to order, from a good breakfast menu. 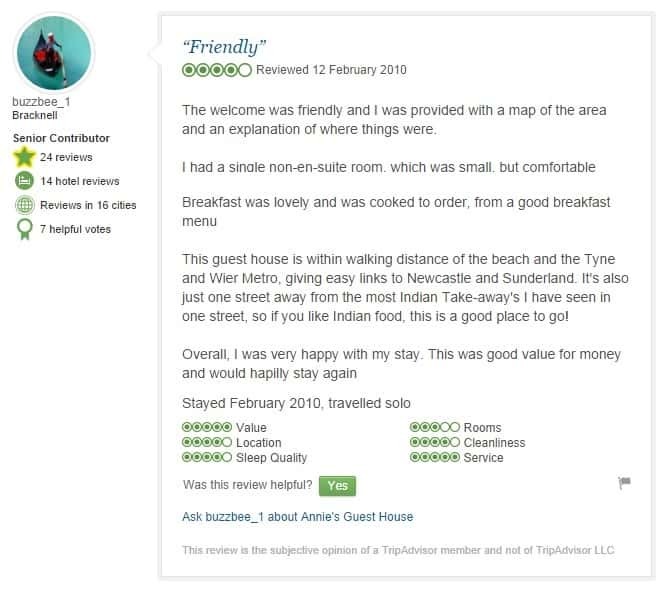 This guest house is within walking distance of the beach and the Tyne and Wear Metro, giving easy links to Newcastle and Sunderland. It's also just one street away from the most Indian take-away's I have seen in one street, so if you like Indian food, this is a good place to go! Overall, I was very happy with my stay. 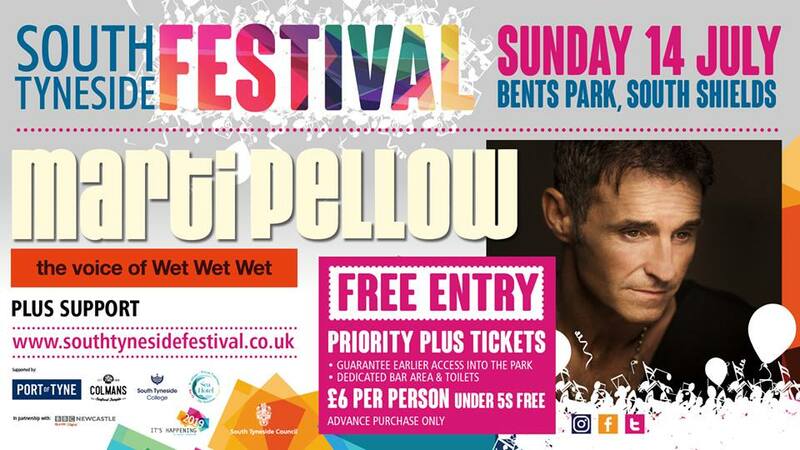 This was good value for money and would hapilly stay again. 5/5. One of the best guest houses / hotels we have stayed in. Everyone was really friendly. The room was spacious and comfortable. Tea and coffee making facilities were excellent - lots of each and biscuits as well. This is the first time in the 18 years my wife and I have been together that we have stayed somewhere and she's had absolutely nothing to complain about. My only comment is that the shower was very small and cramped, but it didn't affect my opinion of our visit in general. 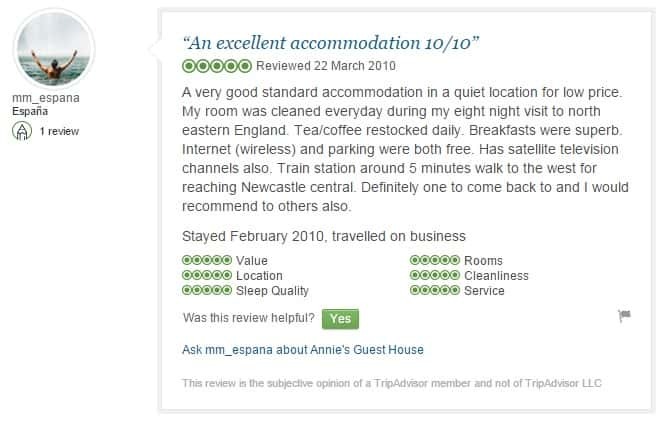 A very pleasant stay. We will come back and also recommend you to friends and family. Excellent. 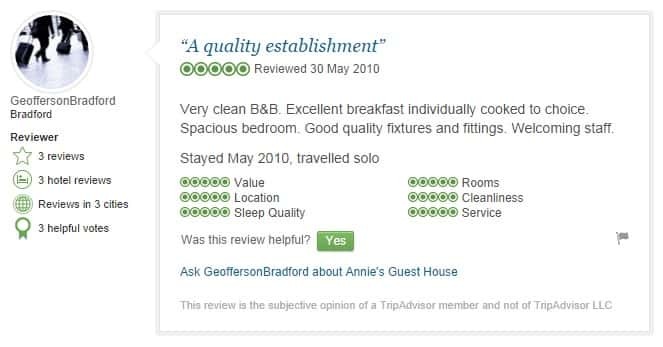 I have stayed at this bnb twice now, both rooms that I have stayed in (sorry I can't remember the numbers) were very good - both were clean and had comfortable beds. Free internet is excellent for business travellers (like me). Takes credit cards for payment without charging any extra % and it's free to park outside as well. Bargain price for what you get and the quality of the room. I would recommend it to others. Thank you so much for making me so welcome during my stay from October 15-20. I enjoyed being at the top of the house and although small, my roomcontained all I needed. You had thought of absolutely every little detail. I will certainly plan to stay with you next time I am in Shields. Thanks again! 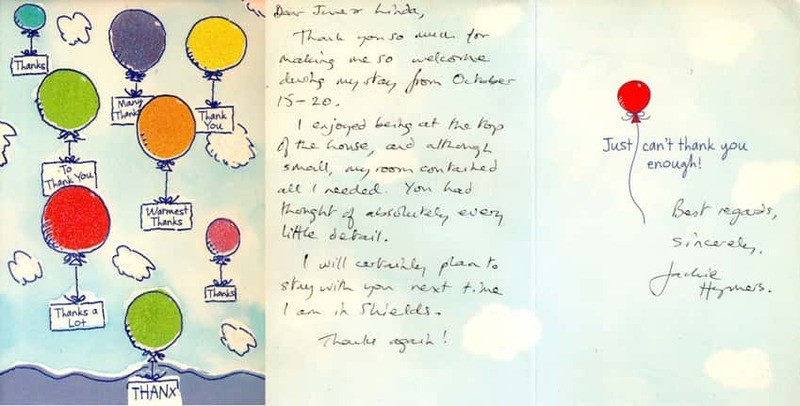 - Thank you card from a guest who stayed five nights in one of our standard single bedrooms.